Description.Limpets are grastropods, which are mollusks (animal that dwells inside the shell) that creates one shell. Limpets are composed of a large group of flattened or elevated shells found along seashores worldwide. The limpet outside shell can be smooth or radially ribbed. They are smooth on the inside and have a horseshoe shaped muscle impression. The animal (mollusk) stick tightly to rocks, the shape of their shell act as a barrier to wave action. Most Limpet Shells feed on algae, passing by as they cling to rocks in the shoreline tidal flow. 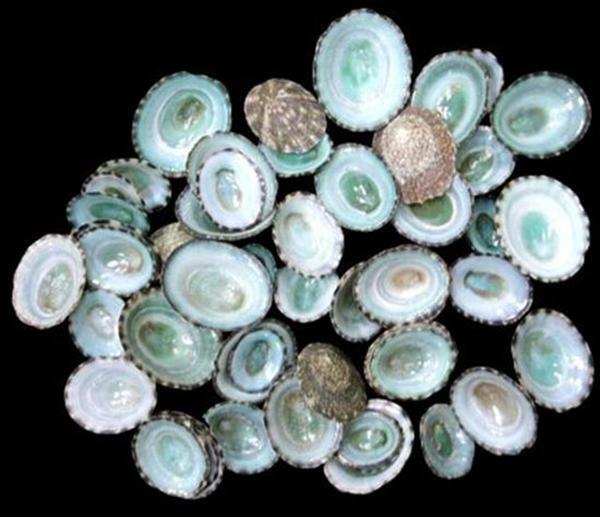 We offer limpets in their natural state, ones that have been polished and or colored. Limpet is the common name of any of the marine gastropod mollusks comprising the order Patellogastropoda, charecterized in extant forms by a flattened, conical or cap-shapped shell and a suckerlike foot without a protective operculum. Among mollosks in the subclass Ortho Gastopoda for which the term limpet is used are such marine forms as the keyhole limpets (Fissurellidae), slipper limpets (Calyptraeidae), hoof limpets (Hipponix), the opisthobranch notaspidean limpets such as Tylodina and Umbraculum, and the pulmonate false limpets (Siphonaria). The name also is used for the freshwater pulmonate river and lake limpets Ancylidae and Acroloxidae. All living limpets (order Patellogastropoda) have flattened, cone-shapped shells, with the apex of the shell commonly situated either at the center of the shell or somewhat towards the anterior. All shells have concentric growth line and many species have additional radial ribs that extend from the shell margin to the apex. 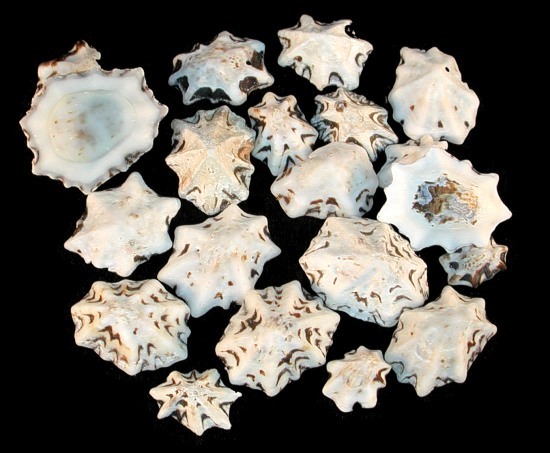 Shells of subtidal species are tipically white or pink in color and intertidal species are usually gray or drab brown with white spot and radial rays. Many limpet shells are often covered in microscopic growths of green marine algae, which can make them even harder to see, as they can closely resemble the rock surface itself. The majority of patellogastopoda species are commonly found adhering to rocks or other hard substrates, looking like little bumps on the surface. They attach themselves to the substrate using pedal mucus and a muscular foot. Tehy move ausing wave-like muscular contractions of the foot when conditions are suitable for them to graze. Tehy can also clamp down against the rock surface with great force, this ability enables them to remain safely attached, despite the dangerous wave action on exposed rocky shores. The ability to clamp down also seals the shell edge against the rock surface, protecting them from desiccation during low tide, despite their being in full sunlight. Patellogastopoda are grazers, generally feeding on algae that grows on rocks or other surfaces, Limpets scrape films of algae with a radula, a ribbon-like tongue with rows of teeth. Insome parts of the world, certain smaller species of true limpet are specialized to live on seagrasses and graze on microscopic algae which grow there. Other species live on, and graze directly on, the stripes (stalks) of brown algae (kelp). Limpets generally will remove diatoms, algal spores, and bits of plant matter from the substrate, with only a very few species able to feed directly on large algae. Equal-size blunt radular teeth are common in species that feed on coral-line age and unequal-sized, pointed radular teeth are common for species that graze on rock substrates and broad, flat-topped teeth are common on species that feed on marine angiosperms. Limpets are preyed upon by a variety of organisms, including starfish, predatory gastropods, shore-birds, fish, lizards, small mammals, seals, and humans. Oyster catchers and other shore birds can by especially voracious predators. At high tide, moving patellogastropoda are vulnerable to aquatic predators and at low tide are vulnerable to shore birds and mammals. Limpets exhibit a variety of defenses, such as fleeing or clamping their shells against the substratum. The defense response can be determined by the type of predator, which can often be detected chemically by the limpet. Limpets found on exposed shores, which have fewer rock pools than sheltered shores and are thus in less frequent contact with water, have a greater risk of desiccation due to the effects of increased sunlight, water evaporation, and the increased wind speed. To avoid drying out, they will clamp to the rock they inhabit, minimizing water-loss from the rim around their base. As this occurs, chemicals are released that promote the vertical growth of the limpet's shell. Larger limpet species are or were historically cooked and eaten in many different parats of the world. They have been part of diets for more that 150,000 years. 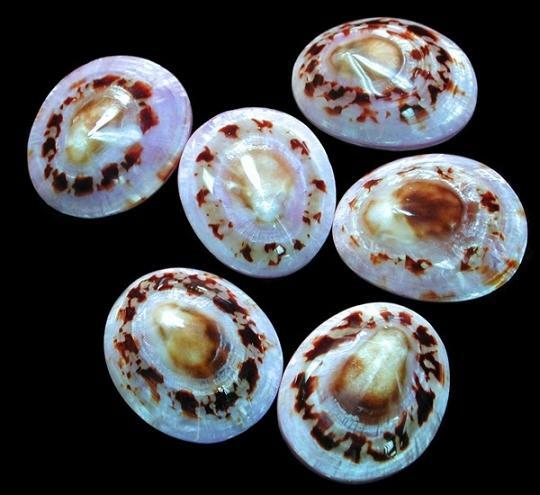 In Hawaii, limpets (Cellana species) are commonly knownas opihi and are considered to be a delicacy. Limpet size is believed to be reduced due to human predation. Some limpet species are used in shell jewelry. They also have appeared in art, with war. The Exile and the Rod LImpet being a well known classic in which Napoleon Bonaparte is seen contimplating a specimen of Patella while exiled on St. Helen. Limpets are used for biological monitoring of ecosystem health. Green Limpets are gastropods (mollusks that create a single shell to live in), they attach themselves to rocks in the intertidal waters. These are excellent craft shells. In all, there are more than 400 species. Most are found in temperate waters distributed worldwide. Patelloida Lottidae, Star LImpets somtimes called the Pacific Sugar Limpet. These are gastopods (molllusks that create a single shell). They have seven or eatht strong radiating ridges, with lesser ridges between, crossed by irregular concentric growth lines. They attach themselves to itertidal rocks. These are excellent craft shells. In all, there are more than 400 species. They arae afound in the Indo-Pacific region from the east Inidan Ocean to the Northern Australian New Zealand shores.